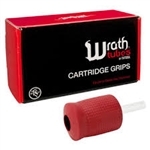 The patent pending Wrath GEN2 Tubes are the newest innovation of TATSoul. Our Second Generation Wrath Tubes have been redesigned to offer even better ink flow, better needle visibility, and better grip control. Additionally, we were able to create the first OPEN magnum disposable tube - only achievable with no flex through our special imported Japanese polymer.